This poster uses words and stark, simple graphics to persuade viewers to give money to the Canadian Red Cross. 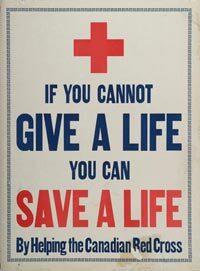 The phrase "giving a life", which, in light of the war's unexpectedly heavy casualties, may have been intended (and understood by readers) quite literally, establishes an equivalence of sacrifice between those serving overseas, at the war front, and those who can yet serve by giving at home. Its immediacy is clear and powerful: support at home saves lives abroad. Note here that the language of appeal is less overtly partisan than that found in many recruiting posters or war bond drives. It speaks directly to the viewer's humanity, and on a very emotional level. Other Red Cross posters would employ similar techniques, often using an angelic, life-saving nurse in the foreground, imploring - in her vibrant, arrestingly rendered eyes and body language - assistance for the soldiers who fight, and are wounded, in the background images.